FREDERICK, MARYLAND, October 25, 2017 - Throughout October & November 2017, Springfield Manor Distillery will showcase its Award-Winning Lavender Gin on the San Francisco Double Gold Tour. Participation in this event is offered only to Double Gold winners of the 2016-2017 San Francisco World Spirits Competition. 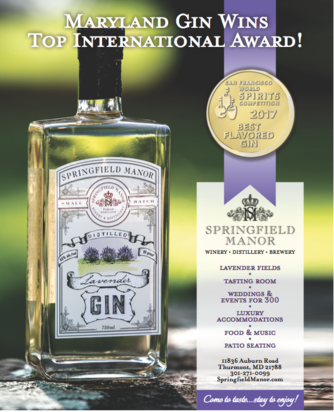 Springfield Manor’s Lavender Gin was awarded a Double Gold – as well as the coveted Best of Class - 2017 Best Flavored Gin . The competition featured 2253 spirit entries from all corners of the world – including 260 gins, a significant increase in the number of entries from previous years. The nationwide tour will stop in six prestigious cities around the country, offering exclusive tastings to spirits buyers, importers, distributors, mixologists, media, bar managers, and restauranteurs in those cities. 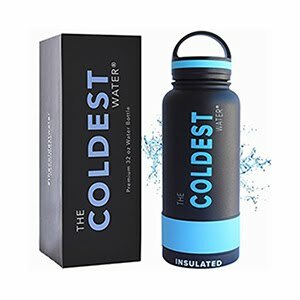 Participating cities include New York, San Francisco, Chicago, Los Angeles, Portland, and Las Vegas. Put together with media partner The Tasting Panel Magazine – this nationwide tour promises to be an exciting platform to promote top winning products and bring maximum exposure to media and beverage-trade professionals. Springfield Manor is Maryland's First Distillery, in operation since 2011. As an artisan craft distiller, Springfield Manor produces a unique line of fine spirits including Bourbon, Rye and Corn Whiskey, Rum, Brandy and Lavender Gin. Spirits are crafted from crops of corn and cultivars of Lavender grown on the 120-acre estate at the foothills of the Catoctin Mountains. The creation of award-winning spirits begins with the limestone spring water, from which the farm was given its name in 1765. Springfield Manor sits atop a limestone aquifer, which produces water with an exquisitely smooth palette feel and virtually no iron. The acclaimed Gin, Bourbon, and whiskeys confirm the exceptional mountain terroir, the superior qualities of the limestone-filtered spring water, and the passion and commitment of the farm’s family. Springfield Manor offers tastings, bottle sales, and a wonderful experience from its onsite tasting room. The venue offers expansive patio seating, live music, scheduled happenings, and event seating for 300 guests. Expanded distribution of the Lavender Gin is coming soon – please check back on our website for updated information.